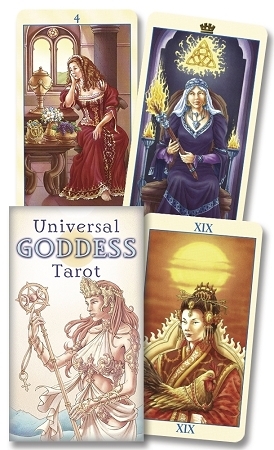 Universal Goddess Tarot Mother, wife, warrior, witch—the divine feminine figure has multiple voices and forms. Each goddess represents an aspect of woman, nature, and the Divine. Use this exquisite deck to seek out the wisdom of Goddesses from mythologies around the world. Publisher Review: The Universal Goddess Tarot manages to succeed, both conceptually and artistically, where other goddess Tarots and oracles fail. First, rather than a random collection of goddesses, it illustrates each arcana with a goddess that expresses the traditional meanings of the cards. Second, it presents the goddesses as complex, real, and, in a way, human. Third, the art manages to express the unique character and culture of each goddess yet the deck as a whole feels unified. Finally, the Little White Booklet captures in very few words the voice of the goddess and the meaning of the card; in addition, it includes a spread that is useful both on a divinatory and spiritual level.